One of the worst things that you can hear when leaving the dentist’s office is that they found a cavity. Though you may have been tipped off by the sharp pain shooting through your teeth every now and again, it’s still a disappointment to hear during an appointment. What’s worse is when you genuinely feel as though you’ve been proactive in avoiding the chance of a cavity and you still wind up with a cavity to care for. If you’re looking to optimize your dental care routine to minimize the chances of ever getting a cavity, here are a few of the things that you can do. Something that you should be familiar hearing by now is that you need to be brushing your teeth regularly. It is suggested that you brush twice a day: once in the morning and once at night. This helps you remove any bacteria that may have been pushed up to the surface of your tongue through the night in the morning, and help ensure that you’ve removed all food particles and as much sugar and saliva build up before bed. The other piece of dental care that you should be familiar with hearing by now is flossing on a regular basis. This should be happening on a daily basis, also twice a day. The best way to ensure that you’re getting this done is to do it right after you’ve finished brushing. This step is going to take care of those hard to reach spots like in between your teeth and underneath those permanent retainers. One of the leading causes of cavities is overconsumption of sugary foods, without a doubt. If you’re really wanting to avoid any cavities from forming beyond your dental care routine, you should try to stay away from sweet treats. These foods break down your enamel and leave your teeth sensitive and vulnerable to cavities, so the less that you consume, the better. Quality is something that makes a difference when we’re talking about products that contribute to your well being, and the same can be said about your dental care products. That means investing in toothpaste that is going to strengthen your teeth, a toothbrush that is going to be gentle yet efficient, and a water flosser that helps you get the plaque and buildup from all the hard to reach places. Though it may seem like you’re going over the top when initially purchasing these products, you will, in fact, notice a difference as you use them — which is what yields healthy teeth without cavities. It’s often suggested that you visit the dentist twice a year to get your teeth cleaned. This helps provide your teeth with the clean feel and pearly white look that we all enjoy. This is also a great time to figure out if you’re in need of any procedures, if you have any cavities, or if gum health is something that you need to worry about. When you visit your dentist, they may suggest that you visit more frequently than twice a year, in which case, plan accordingly. 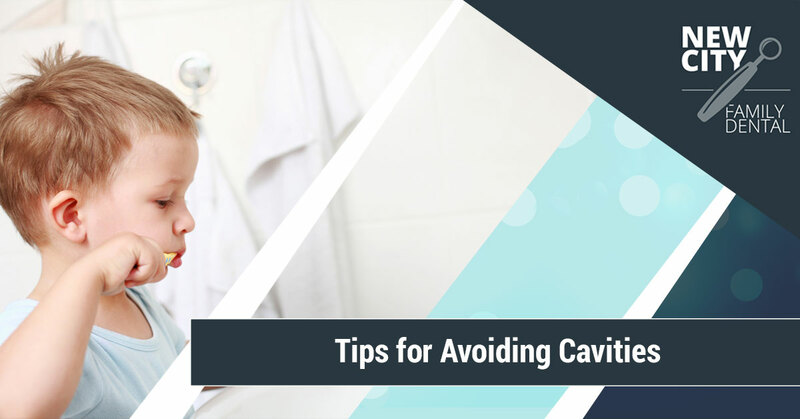 If you are still curious about other tactics that you can use to avoid cavities, ask your dentist. They will always provide you with countless ways that you can prioritize your dental hygiene. What’s more than that, though, is that every mouth is different, so it only makes sense that they need various forms of care. Your personal dentist will be able to provide you with more tips and guidance that are specific to your teeth and your mouth. For example, some people are prone to cavities while others are prone to plaque buildup. These two different types of mouths are going to need two different kinds of products to maintain their dental hygiene, and understanding what works for your mouth could make all the difference to avoiding cavities in the long run. The team at New City Family Dental can provide you with all of the dental care and assistance that you need. Feel free to reach out to us with any questions that you have or to schedule an appointment. We can’t wait to add you to our family!